If you have children, then you know how important it is to care for them properly. I have seen neglected children, and it is a heart-wrenching and miserable existence for them. I am the mother of 2 children and our third is due in May. One blessing of the due dates for both of my children was that they were born in the summer months. This is wonderful because we don't have to worry about taking newborns home from the hospital in windy and snowy weather. Both of my children came home on hot and humid days and most of the time, they needed very little bundling. My mom is a mother to 6 children and ALWAYS (no matter what the weather) bundled her babies. I remember her helping to care for my daughter the first few weeks we had her home and she (mom) would always wrap Hannah in blankets and always put a baby hat on her. Now, I have nothing against baby hats but when it is 80 degrees outside, there is no need for one. 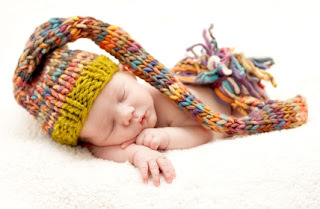 I am for newborn hats though, especially when the baby is first born and needs to retain their body heat. What cute hats there are today in hospitals!! My babies always had huge heads so it was hard to fit the hat comfortably on their heads. :) So, with this coming baby I am excited to see if the hospital has changed their "style" of hats and what they will look like on our new little peanut!